All of the finalist, commended, highly commended and winning work from the Quality in Care (QiC) Diabetes Awards 2016 is now available in case study format. You can view these highly effective projects and see how the teams overcame their challenges to deliver real change in behaviours and outcomes. 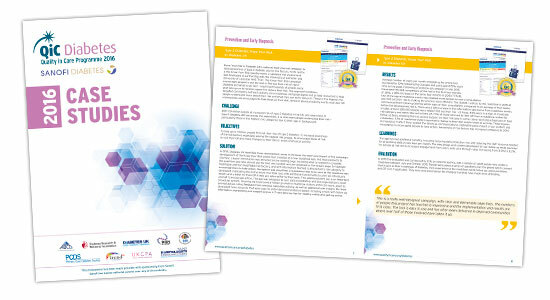 The full case studies are all available free of charge - and can be accessed by either downloading the pdf of all 36 case studies from the button below - or you can view them as web pages alongside all of the QiC Diabetes Case Studies. These can be filtered by category and feature all the projects recognised by QiC Diabetes since its launch in 2011. The online case studies also offer links to download supporting materials / checklists / fact sheets and other resources for each case study. If you want more information you can also contact the teams directly from the online case study or contact us and we will put you in touch with them. Don't forget to register your interest for the awards via our registration form and we will keep you up to date with the programme's development.